Free shipping. Buy direct from HP. 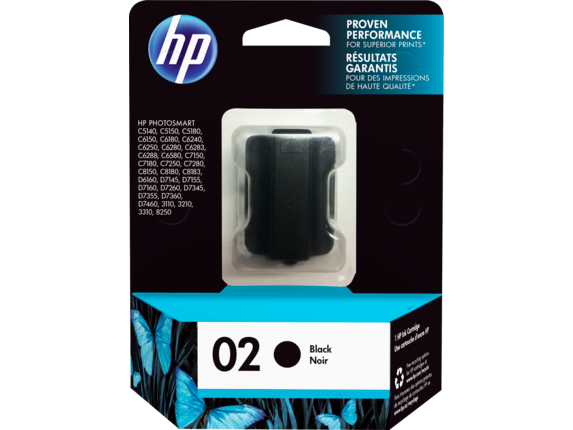 See customer reviews and comparisons for the HP 02 Black Original Ink Cartridge. Upgrades and savings on select products. Original HP inks provide vivid, consistent color for true-to-life photos and crisp, laser-quality documents. For optimal performance, the inks are formulated to resist fading, smudging and bleeding—and are designed for use in your HP printer. Original HP inks deliver vivid, true-to-life colors and sharp, laser-quality black text.For optimal reliability and performance, Original HP inks are pure, and free of harmful contaminants.Low-colorant Original HP inks provide a wide range of realistic fade-resistant images.For optimal results, Original HP inks are specially formulated to work with your HP printing system. Original HP inks are formulated to avoid common problems that can affect image quality and waste ink.All six HP ink cartridges are sold separately—so you can replace only the colors you need.For optimal reliability and performance, Original HP inks are pure, and free of harmful contaminants.HP Smart Printing technology  eliminates waste by preventing partial printing of a page or photo. For optimal reliability and performance, Original HP inks are pure, and free of harmful contaminants.The HP ink delivery system is engineered to maintain purity over the life of your HP printer.Original HP inks are formulated to avoid common problems that can affect image quality and waste ink. All six HP ink cartridges are sold separately—so you can replace only the colors you need.The color and symbol on each HP ink cartridge matches only one position in your HP printer.HP Smart printing technology  confirms correct cartridge installation and monitors ink levels.SureSupply, enabled by HP Smart Printing technology , lets you know which Original HP inks to order. Original HP inks are formulated to avoid common problems that can affect image quality and waste ink.All six HP ink cartridges are sold separately—so you can replace only the colors you need.For optimal reliability and performance, Original HP inks are pure, and free of harmful contaminants.HP Smart Printing technology eliminates waste by preventing partial printing of a page or photo. All six HP ink cartridges are sold separately—so you can replace only the colors you need.The color and symbol on each HP ink cartridge matches only one position in your HP printer.HP Smart printing technology confirms correct cartridge installation and monitors ink levels.SureSupply, enabled by HP Smart Printing technology, lets you know which Original HP inks to order. 1 Based on Wilhelm Imaging Research, Inc., or HP Image Permanence Lab display permanence testing under glass using the HP 02 Ink cartridge on HP Premium Plus Photo Paper. For details, see http://www.hp.com/go/printpermanence. 2 Using genuine supplies ensures availability of HP printing features. 3 Program availability varies. HP ink cartridge return and recycling is currently available in more than 30 countries in Asia, Europe and North America through HP Planet Partners program.